Playing golf in Aruba can be a challenge to golfers of all abilities due to the varying wind conditions on the island. It will be a guaranteed unique experience and lots of fun for all. The Tierra Del Sol golf course is located at the northwest tip of the island of Aruba, near the Tierra Del Sol Resort, Spa and Country Club. It is the only world class 18 hole, par-71 championship golf course on the island. It was designed by Robert Trent Jones II, and displays stunning bursts of green on a desert countryside. Its luxurious surroundings and spectacular views of the ocean will take your breath away. Playing golf in Aruba at this beautiful golf course will be an experience to remember. It can be used by guests staying at any resort on the island and is only a 5-10 minute car ride from all major resorts. It has a clubhouse, golf shop, restaurant and pool. It includes a full length practice range, putting green, chipping areas and has a Golf Clinic offering professional instruction to all levels of golfers. This course also has the Parview GPS yardage system, which gives golfers a virtual view of the field and allows for electronic scoring. This golf course is located at the Divi Village Golf & Beach Resort in Aruba, across from Druif Beach along the west coast of Aruba. The Links at Divi Aruba is a new beautifully landscaped 9 hole golf course surrounded by luxury villas. It was designed by architects Litten & Viola. This course is open to the public with preferred tee times for Divi Resort guests. This course surrounds an exclusive clubhouse and has 2 gourmet restaurants and a water view lounge. It has a Pro Shop, Mulligan’s Bar & Restaurant, and The Windows on Aruba which is a glass enclosed restaurant with great views of the ocean and the golf course. It also offers professional golf instructions and has a chipping area, a driving range, and bunker practice areas. 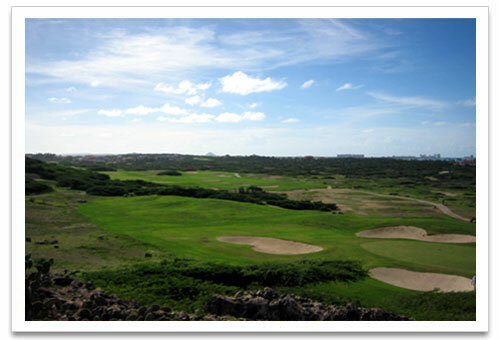 This is the oldest golf course on the island and is located on the southeastern coast of Aruba. It is a nine hole desert course with no grass but it has oiled sand greens (which doesn’t look green at all). It is the Caribbean’s most unusual golf course. You may have to nudge away an occasional goat or two while playing golf in Aruba on this course. Putting can be a very different experience on this golf course but many are up for the challenge. You definitely will have fun and lots of laughs as well as stories to tell your friends and fellow golfers. This golf course makes golf in Aruba a fun and unique experience. *Please check with all golf courses for the most current prices. After a round of golf you may want to check out our Aruba Nightlife page.